This week he opened up the doors on his Creative Entrepreneur Roadmap once again. I was a student the first year it ran and I still use the material today. I wrote a review about the course when he opened doors last year, and I wanted to share it once again as I know there are a lot of people considering signing up. For the price, this is a ridiculous offer. Look at Mark's cheeky little face peeking out there! It’s overloaded with concrete content, and they’ve recently added more options and content. There’s even the chance to get personal one-to-one coaching with Mark (which I’ve done before – he’s lovely AND he knows what he’s talking about with creative biz people – a rare combination!). I signed up for the course when it was first launched in November 2009 and now there are is a bigger and better version of the course released. Lateral Action is a website that focuses on tools and resources for creative entrepreneurs (think writers, copywriters, artists – any creative field really). It’s run by Mark McGuinness who worked with Brian Clark and Tony Clark from Copyblogger to get it where it is today. Its articles help you realise the importance of creativity as an essential tool for economic survival whilst hammering home the point that creativity isn’t enough on its own, you’ve got to be taking focused action (rather than just being “busy”) to be successful. The audio interviews are perfect if you want to listen to them on your morning run, on your commute to work, and the transcripts are great if you’re a reader like me and like to study at your desk or in your favourite chair. Interested in finding out more? 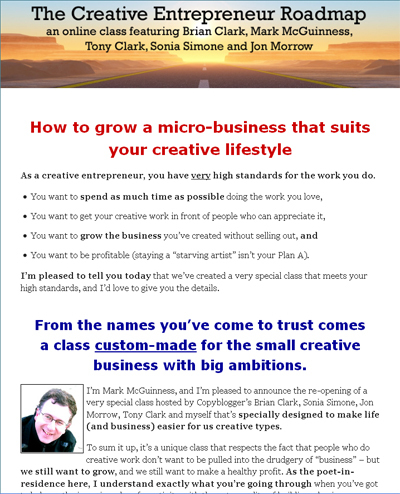 Head on over to the Information Page all about the Creative Entrepreneur Roadmap!